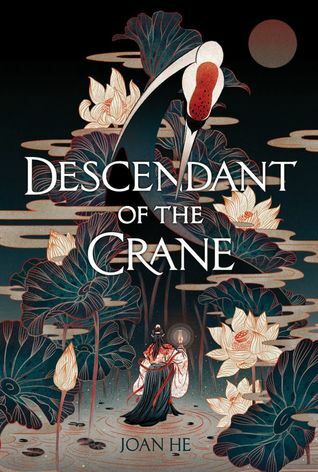 I requested an eArc of Descendant of the Crane by Joan He from Netgalley, and I am also a member of the street team for the book! (Ministry of Works, what!!!) I am so happy I finally got a chance to read it, I feel like it’s been glaring at me through my kindle forever. Once again, as has been the case so often with Asian inspired YA, this wasn’t what I was expecting! Also, Asian inspired YA gets the best covers, amirite? I was drawn to this book due in part to my love of Shadow of the Fox by Julie Kagawa, there is no denying that. The two books are very very different! Descendant also differs a great deal from The Girl King by Mimi Yu, yet another recent release that I loved. This all conspires to indicate that I may just have a soft spot for books in this vein. Whether or not that is the case, I found a lot to love in Joan He’s debut novel. I knew the book had a pretty big cast of characters, but I felt that the focus was primarily on Hesina. She is tasked with a big job early on in the book, arguably the biggest. She has to deal with a lot of family drama simultaneously, and I felt that she was able to balance it all fairly well considering the amount of emotional trauma she had to wade through. Akira was a character I thought I would love, and I did enjoy him, but he didn’t get enough page time for me to really sink my teeth into him as a character. He did however play a large role in one of my favorite aspects of the book. Descendant spends a lot of time exploring the justice system of Yan, Hesina’s home country. Not only are the laws society has to follow laid out, but the actual execution of those laws is tracked through court proceedings. I thought this was super interesting and fed into my love of true crime drama. Totally unexpected in this YA fantasy novel, and I ate it up! It did slow the pace down somewhat, but I didn’t mind it. You might be surprised by it if you are wanting something more high action. Though there are some really awesome fight scenes, don’t despair! In addition to the justice system, Hesina’s court and her people play a huge role in the plot. She spends a lot of time thinking about how her choices will affect everyone in Yan, for good or ill. I thought it was refreshing to see a YA book with royals at the fore, where downstream effects on the whole country were actually important. So often I feel like the choices made by YA royals only matter to the royals, but of course their people will be impacted. I have so many additional thoughts on the book, so I’m going to post about it again closer to the release date. The ending was so powerful, I cannot wait to do a reread, and of course to get my hands on book 2. Let me know if you’re planning on picking this one up on April 2nd! Ooh I’m excited for this one! Actually for all the asian inspired fantasy we’re getting! It’s great! Every book is another step towards equality for marginalized authors! This is one I think you could get into! I loved the courtroom drama, it felt so different from a lot of YA right now.